40 Mm 2-D Ring Clip. 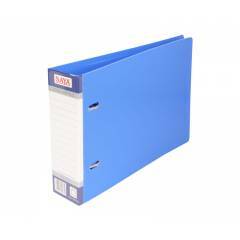 A strong and handy voucher file to store vouchers slips easily.. Uses 40mm wide strong D ring clip to secure punched vouchers..
Hard and durable PP sheet for attractive looks and yet longer life..
Spine label pocket for better personalization..
Saya Blue Voucher File, Dimensions: 283 x 54 x 178 mm (Pack of 2) is a premium quality Report Covers from Saya. Moglix is a well-known ecommerce platform for qualitative range of Report Covers. All Saya Blue Voucher File, Dimensions: 283 x 54 x 178 mm (Pack of 2) are manufactured by using quality assured material and advanced techniques, which make them up to the standard in this highly challenging field. The materials utilized to manufacture Saya Blue Voucher File, Dimensions: 283 x 54 x 178 mm (Pack of 2), are sourced from the most reliable and official Report Covers vendors, chosen after performing detailed market surveys. Thus, Saya products are widely acknowledged in the market for their high quality. We are dedicatedly involved in providing an excellent quality array of Saya Report Covers.